On Tuesday, October 9th, the New Moon enters Libra. Themes of this New Moon are harmony, balance, and beauty. The New Moon in Libra asks you to look within and examine where you can find balance and harmony within yourself. Your outer world is a reflection of your inner world, so take time this New Moon to write out where you’d like to find more peace within your body, mind and spirit. Rather than retreating to a solo place, Libra is known for finding balance and harmony amongst the craziness of her surroundings. Where can you find more balance within yourself when the chaos of life is surrounding you? Focus on the beauty you see in the world during this New Moon, and see where more of that beauty starts showing up as you shift your focus. We often are told the Universe is always speaking to us, but keep in mind it’s a two-way conversation. Spend time thinking (or writing a list!) of all the things that make you feel peaceful and happy, and ask for more of those things to show up for you. Balance and harmony are available to you, you just have to make it a point to truly harness those feelings, and this New Moon is the perfect time for doing just that. 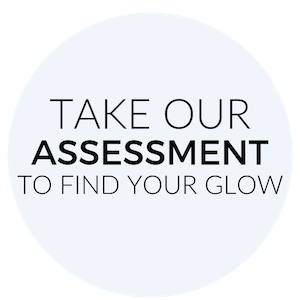 If you need help, check out our GlowBook Introductory exercises, here! New Moon Visualization: Close your eyes and imagine yourself walking through a garden. Envision all the luscious green and vibrant flowers. As you’re walking through this garden, feel a strong sense of peace. Eventually, you spot someone coming towards you. As you get closer, you see it’s the most radiant version of yourself. Sit down with them and ask them how they got through any stress or struggles that you’re currently facing. Listen to the words of wisdom that they speak. Stay for as long as you’d like, and remember you can always go back and visit this garden, visit you, whenever you need to. Moon in Aries: Like Sagittarius, you are an ambitious fire sign who is always ready for adventure. Rather than physical adventure, this New Moon is asking you to explore all the possibilities of your future. This Moon is encouraging you to take a courageous leap and examine all possibilities of where you can land as you fall. It is safe to trust yourself as you lead yourself into unknown territory, Aries Moon. Moon in Taurus: Have fun and shake things up a bit during this time, Taurus Moon. You love to be a homebody but it’s time for some fresh perspective, and you won’t get it from hiding out where you feel comfortable. Your heart is asking you to explore unknown territory and see where it could lead you. Whether you go out with someone you usually wouldn’t go out with, or take yourself somewhere new for some solo time, the time is here to do so. Treat yourself, Taurus Moon. Home will be waiting for you at the end of your adventures. Moon in Gemini: You get along great with the energy of this New Moon, just remember you don’t need to have the answers to everything. Naturally curious and strong-willed, this moon will make you feel even more adventurous and ambitious but allow things to remain light. You often like to analyze everything that’s around you and it can keep you from fully enjoying the moment. Have fun with your curiosity this New Moon and see where it leads you. You don’t have to know why you just have to be open to all the possibilities that surround you. Moon in Cancer: This Moon is likely to be a little uncomfortable for you at first, Cancer Moon, but it is up to you how the energy plays out in your life over the next few days. You like to feel in charge and this Moon is asking you to go with the flow and be open to receiving. Be open! You’re like the Mama Bear of your group, always looking out for and leading others, but this Moon is granting you permission to be one of the cubs, and now you have to grant yourself that same permission. Loosening up doesn’t mean you aren’t being a leader, it actually demonstrates to others that even the toughest leaders can have some fun now and then. Give yourself a break. In doing so it’ll calm the people around you and the energy around you will lighten up. Moon in Leo: This is a time of heightened power for you, Leo Moon. You need no one to hold your hand as you trailblaze ahead. Remember just how powerful you are alone. Chase down the visions you’ve been having for yourself. Act on them. This is a peak time of manifestation for you. Take a look at your visions from as many different angles as you can and see what information you gather from that, then act. Your time is now. Moon in Virgo: This Moon may feel a little messy to you, but you can turn that into something wonderful. You generally like structure, and the energy of Sagittarius is unpredictable and adventurous. The best thing you can do is jump into the delightful chaos of Sagittarius and see what you learn about yourself from it. You won’t have any fun getting frustrated over the disorder of things this New Moon. As the saying goes, if you can’t beat them, join them. Jump into the craziness and you may just surprise yourself with how much fun you will have. Set the intention to learn something new about yourself as you go with the flow of this New Moon energy. Moon in Libra: You have a great sense of balance, which will be extremely useful and calming to others during this time, Libra Moon. While you have no problem jumping into the charming chaos of the season, others around you will be feeling a bit uncomfortable by it all. With your easy going attitude and grounding energy, people will gravitate towards you this New Moon. Show others how there are calmness and harmony within the chaos. You are a great leader, and this New Moon is asking you to step up for the others around you. Be sure to enjoy the season and have some fun yourself as well, Libra Moon. Moon in Scorpio: It has been an eventful year for you, Scorpio Moon. As we are approaching the end of it, this year’s final New Moon is asking you to let go of any tensions you’ve been holding onto. This is a big time of release. You tend to keep things stored up inside out of fear of rocking the boat, but communication is necessary right now. Instead of quietly analyzing things in the corner, converse with those around you. Lighten up and share what’s on your mind, you will be so glad you did. Moon in Sagittarius: You are home, Sagittarius Moon. This New Moon is a delight for you. Take time to envision where you want to travel this upcoming year, what goals you want to achieve, what events you might want to attend, and whatever else comes up when dreaming of the future. You embody the Archer, so aim high and be direct about what you want, then keep being your happy go lucky self and let the Universe do its work. This is a very cheerful time for you, and manifesting things you desire always works faster when you are feeling joyous, so get to work. Moon in Capricorn: Practicing mindfulness is key for you this New Moon. This is a great time to ground yourself and get curious about the world around you, Capricorn Moon. Imagine yourself sitting still, and as the world turns around you, you see its many different angles. Allow yourself to daydream but remember to stay grounded so you can begin taking action. Your daydreams are messages of the future, and you, my love, are here physically to make sure they come true. Spend time this New Moon figuring out your next steps that will lead to exploration and adventure down the road. Moon in Aquarius: The energy of this New Moon is just what you’ve been needing. It’s time to get out and immerse yourself with a whole new group of people, Aquarius Moon. In order to grow, you must experience new people and new places, which is something you naturally like to do. There’s no reason to feel guilt around taking time to explore new territory this New Moon, it is actually necessary for your growth and creativity. Get exploring, love. Moon in Pisces: Now isn’t the time to slow down as much as you may want to, Pisces Moon. This New Moon carries a fast pace energy and is requesting you hop-to. The key to this New Moon is to find your inner peace while moving swiftly through the days and cranking out any end of the year work that needs to be done. As the New Year comes in there will be time for rest and reflection, but it is important you keep your energy up and make big moves through the year’s final New Moon. There is lots to be done and the energy is on your side to make it happen, welcome it in and get it done, love.